The interaction of particulates with resident macrophages is a consistent feature in certain forms of crystal-induced inflammation, for example, in synovial tissues, lung, and the peritoneum. The mitogenic activity of basic calcium phosphate (BCP) crystals and calcium pyrophosphate dihydrate (CPPD) crystals on synovial fibroblasts has been considered relevant to the synovial hyperplasia observed in crystal-induced arthritis. The aim of the study was to determine whether microcrystals such as these could enhance macrophage survival and induce DNA synthesis, thus indicating that they may contribute to the tissue hyperplasia. Murine bone-marrow-derived macrophages were treated in vitro with microcrystals, the cell numbers were monitored over time, and DNA synthesis was measured as the incorporation of [methyl-3H]thymidine (TdR). We report here that BCP, monosodium urate, talc, and, to a lesser extent, CPPD crystals promote macrophage survival and DNA synthesis; the latter response is particularly striking in the presence of low concentrations of macrophage-colony stimulating factor (M-CSF, CSF-1). Enhanced macrophage survival or proliferation may contribute to the synovial hyperplasia noted in crystal-associated arthropathies, as well as to talc-induced inflammation and granuloma formation. The crystals studied join the list of particulates having these effects on macrophages, indicating the generality of this type of response. Intra-articular basic calcium phosphate (BCP) (hydroxyapatite, octacalcium phosphate, tricalcium phosphate) crystal-deposition disease is associated clinically with severe degenerative arthritis characterized by hyperplasia of the synovial lining and loss of intrasynovial collagenous structures . The interaction of the crystals with inflammatory cells is believed to be a key factor in crystal-induced inflammation . Deposition of calcium pyrophosphate dihydrate (CPPD) crystals has been associated with the acute inflammatory arthritis of 'pseudogout' . Synovial thickening is a common clinical finding in the affected joints of patients with deposition of CPPD crystals. Histologically, synovial-cell hyperplasia and infiltration by mononuclear inflammatory cells are seen [3,4]; CPPD crystals are phagocytosed by cells of the synovial lining . Gout, pseudogout, and acute articular and periarticular inflammation caused by BCP crystals can behave similarly, reflecting the fact that BCP and CPPD crystals share many of the fundamental mechanisms of cell activation utilized by urate crystals [5,6]. Acute gout, even though initiated by deposition of monosodium urate (MSU) crystals in the synovium, is often associated with systemic inflammatory manifestations . Talc (magnesium silicate) crystals, present in aerosols of respirable talc and surgical gloves, can cause, respectively, inflammatory reactions in the lung or a granulomatous reaction with peritoneal adhesions [8,9]. Exposure to talc leads to the development of granulomas containing macrophages . Injection of talc into rabbit knees induces synovitis . Macrophage-colony-stimulating factor (M-CSF), also called colony stimulating factor-1 (CSF-1), is an important regulator of the development and function of macrophage lineages throughout the body . There are in vivo data suggesting that both synovial and peritoneal macrophages are completely dependent upon CSF-1 for their development . One cell type that is normally resident in the synovium, and interacts in vivo with the various crystals mentioned above, is the macrophage (mononuclear phagocyte) . We have previously shown that a number of particulates, including oxidized low-density lipoprotein (oxLDL) , adjuvants , and β-amyloid and prion protein fibrillogenic peptides (manuscript in preparation), were able to induce macrophage survival; they could also induce a proliferative response, particularly in the presence of circulating concentrations of CSF-1. We report here that BCP, MSU, talc, and, to a lesser extent, CPPD all promote the survival of murine bone marrow-derived macrophages (BMMs) and the synthesis of DNA, the latter response being potentiated again by low (suboptimal) CSF-1 concentrations. As before, BMMs were generated as adherent cells from their nonadherent progenitors in the bone marrow of CBA mice (obtained from Monash University Animal Services, Clayton) and grown to confluence in 24-well plates (Nunc, Roskilde, Denmark) in the presence of CSF-1 (≥ 10,000 U/ml) [14,15]; the cells were prepared for an experiment by being washed twice with phosphate-buffered saline solution and the experiment was commenced immediately. For counting of BMMs, the medium was removed and the cells were gently scraped; viable cells were counted in a hemocytometer with the use of trypan blue exclusion . DNA synthesis was measured as the incorporation of [methyl-3H]thymidine (TdR) (2 μCi/ml) as before [14,15]. BCP crystals were synthesized by a modification of published methods . The crystals were crushed and sieved to yield aggregates 10–20 μm in diameter, which were sterilized and rendered pyrogen free by heating at 200°C for 90 min. Triclinic CPPD crystals (10–50 μm in diameter) were synthesized and characterized as described elsewhere . MSU monohydrate crystals (2–30 μm in diameter) were prepared from twice-recrystallized uric acid (Sigma Co, St Louis, MO, USA) and sodium hydroxide as previously described  and heated to 180°C for 2 h to render them pyrogen-free. Talc was US Pharmacopcia grade, as used clinically for pleurodesis; it was a gift from A Allison, Palo Alto, CA, USA. All crystals were resuspended in RPMI before culture. The following reagents were obtained from commercial sources: [3H]TdR (80 Ci/mmol; Amersham Corp) and FBS (CSL, Parkville, Australia). Recombinant human CSF-1 (M-CSF) was a gift from Chiron Corp., Emeryville, CA, USA. All practical precautions for minimizing endotoxin contamination were taken [14,15]. Student's two-tailed t-test was used for the comparison of two mean values; P < 0.05 was considered statistically significant. Upon removal of CSF-1, BMMs gradually die by apoptosis . However, as seen in Table 1, BCP crystals and, to a lesser extent, CPPD crystals prevented cell loss. For BCP, there was still activity at 50 μg/ml, and the optimal concentration for enhanced survival was ≥ 100 μg/ml (data not shown). The concentrations of BCP and CPPD used were determined from previous studies of dose–response relationships and the mitogenic response in fibroblasts , and from the concentrations found in pathologic joint fluids . BMMs (13.0 ± 0.6 × 104) from which CSF-1 had just been removed were cultured in RPMI/10% FBS, in the absence or presence of BCP (500 μg/ml) or CPPD (500 μg/ml). After one day, cells were washed twice to remove cystals and recultured in RPMI/10% FBS for a further two days. Then the number of viable cells was determined by hemocytometer counting and trypan blue exclusion. Data are mean values ± SEM from triplicate cultures and are from a representative experiment that was repeated once. aP < 0.05 in comparison with untreated group (Student's two-tailed t-test). We next determined whether the crystals induced BMMs to synthesize DNA. BCP stimulated BMM DNA synthesis in a dose–dependent manner (Fig. 1a); higher concentrations than those shown were toxic. CPPD, at its optimal concentration (500 μg/ml), stimulated BMM DNA synthesis (Table 2), albeit weakly in comparison with the effect of BCP and corresponding to its weaker effect on BMM survival. Effect of BCP and talc doses on DNA synthesis in BMMs. BMMs from which CSF-1 had just been removed were cultured in RPMI/10%FBS, in the absence or presence of increasing concentrations of (a) BCP and (b) talc. After one day, cells were washed twice to remove crystals and recultured in RPMI/10%FBS containing [3H]TdR for a further two days. Data are mean values ± SEM from triplicate cultures and are from a representative experiment that was repeated five times. BMMs from which CSF-1 had just been removed were cultured as described in Table 1. After one day, cells were washed twice to remove cystals and recultured in RPMI/10% FBS containing [3H]TdR (2 μCi) for a further two days. Data are mean values ± SEMfrom triplicate cultures and are from a representative experiment that was repeated eight times. aP < 0.05 in comparison with untreated group (Student's two-tailed t-test). MSU crystals promoted BMM DNA synthesis at the optimal concentration of 500 μg/ml (Table 3); they were active at ≥ 100 μg/ml (data not shown). The dose–response curve for talc, another biologically relevant particle, is presented in Fig. 1b; concentrations higher than those shown were toxic. The promotion of DNA synthesis by MSU and talc indicates that they also prevented cell death. BMMs from which CSF-1 had just been removed were cultured in RPMI/10%FBS, in the absence or presence of monosodium urate (MSU) (500 μg/ml) or BCP (500 μg/ml). After one day, cells were pulsed with [3H]TdR for a further two days. Data are mean values ± SEM from triplicate cultures and are from a representative experiment that was repeated twice. We have reported previously that other particulates, such as oxLDL and adjuvants, stimulate BMM DNA synthesis and they do this in a synergistic manner with CSF-1 [14,15]. As can be seen in Fig. 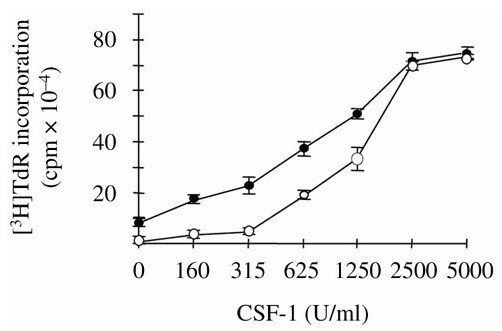 2, the stimulation of BMM DNA synthesis by BCP was potentiated by concentrations of CSF-1 that by themselves were suboptimal for the induction of DNA synthesis. For example, in the experiment whose data are provided, the [3H]TdR incorporation value of 8.1 ± 1.0 × 104 cpm resulting from the action of BCP alone rose to 22.4 ± 3.1 × 104 cpm in the presence of 315 U/ml CSF-1, which by itself gave a value of 4.4 ± 0.1 × 104 cpm. BMMs treated with MSU and talc also behaved similarly in the presence of a suboptimal concentration of CSF-1 (data not shown). Effect of BCP on DNA synthesis in BMMs in the presence of CSF-1. BMMs from which CSF-1 had just been removed were cultured in RPMI/10%FBS in the presence of increasing concentrations of CSF-1, in either the absence (○) or the presence (◎) of BCP (100 μg/ml). After one day, cells were washed twice to remove BCP, recultured again in the increasing CSF-1 concentrations, and pulsed with [3H]TdR for a further two days. Data are mean values ± SEM from triplicate cultures and are from a representative experiment that was repeated seven times. We have shown that a range of biologically relevant crystals promote macrophage survival and DNA synthesis, the latter response being more dramatic in the presence of suboptimal concentrations of CSF-1. Such enhancement of macrophage survival by crystals, if it occurred in vivo, would lengthen the cells' tenure in a lesion (e.g. synovium), with the result that more cells would be present to produce inflammatory mediators, such as cytokines, proteinases, eicosanoids etc, perhaps potentiated by additional stimuli. This phenomenon could be another mechanism contributing to the synovial hyperplasia attributed to crystals in joints ; it also may form part of how macrophage cell numbers increase in talc-induced granulomas and inflammatory reactions . The degree of inflammation provoked experimentally by crystals in vivo is quite variable . The capacity of crystal-treated monocytes or macrophages to produce inflammatory cytokines in vitro is likewise variable. For example, Malawista and coworkers found that the capacity of BCP and CPPD crystals to directly induce interleukin-1β and tumor necrosis factor-α in monocytes in vitro is weaker and less consistent than that of urate crystals . In other words, the triggering of crystal-induced inflammation is not an 'all-or-nothing' response related to the new appearance of free crystals , and additional stimuli may be important. The BMMs used in the above studies are a CSF-1-dependent population. As mentioned, there is evidence in the mouse that synovial and peritoneal macrophages are two populations that show CSF-1 dependence for their development . In this sense, BMMs may represent a suitable model for these cells. It is likely that macrophages in vivo will be exposed to the low circulating concentrations of CSF-1, presumably responsible for their survival and steady-state turnover . Since there is evidence of elevated CSF-1 concentrations in synovial fluids from patients with rheumatoid arthritis , those concentrations may also be raised in crystal-containing joints as part of the inflammatory reaction. CSF-1 can have proinflammatory effects in murine models of arthritis [21,22], and CSF-1-deficient (op/op) mice do not develop collagen-induced arthritis . Our findings suggest that when macrophages are exposed to, or 'loaded' with, the range of crystals analyzed above, they are 'primed', so that they are able to proliferate better in the presence of CSF-1 doses that are suboptimal, i.e. that normally provide a survival signal or a weak proliferative one in vivo. If this potentiation were occurring in vivo with crystal-'loaded' macrophages, then again it could be contributing to the previously mentioned hyperplasia in joints and granulomas. As discussed earlier, a number of clinical observations have suggested that articular inflammatory cells are 'primed' by crystals to heightened responsiveness to local stimuli . Other observations have suggested that crystal-induced synovial fibroblast proliferation is a mechanism for increasing the number of synovial cells, which would then be capable of eliciting inflammatory mediators . By analogy, our studies suggest that enhanced local macrophage survival or proliferation in the synovium (or in granulomas) should also be considered, in the same way, as a possible contributing factor. In support of this concept, there is evidence in a lentivirus model of arthritis that macrophages proliferate in the synovium  and in various types of granuloma . The range of active materials promoting macrophage survival and DNA synthesis in the studies mentioned above indicates that calcium is not a necessary component. In synovial fibroblasts, by contrast, MSU only very slightly stimulated DNA synthesis, if at all, compared with BCP and CPPD . However, in agreement with the synovial fibroblast response , latex did not support DNA synthesis in BMMs . Crystals therefore join the list of particulates — for example, oxLDL  and certain adjuvants (aluminum salts, emulsions of oil in water, silica)  — that we have found to be capable of promoting macrophage survival and DNA synthesis, with potentiation again being observed with suboptimal CSF-1 concentrations. In each instance, including that of the materials studied here, the responses of the macrophages have been proposed to account, in part at least, for the increased numbers of cells of macrophage lineage at various sites of chronic inflammation, for example, an atherosclerotic plaque, in response to particulates which are usually poorly degraded. Perhaps such a mechanism may be quite a general one, offering an explanation for the persistence (chronicity) of a number of inflammatory lesions leading to pathology. The molecular events responsible for the enhanced survival and proliferation await analysis. BCP, MSU, talc, and, to a lesser extent, CPPD all promote murine macrophage survival and DNA synthesis, the latter response being potentiated by low (suboptimal) CSF-1 concentrations. Such enhanced macrophage survival or proliferation may contribute to the synovial hyperplasia noted in crystal-associated arthropathies, as well as to talc-induced inflammation. The crystals mentioned above can therefore be included in the list of particulates having these effects on macrophages, indicating the generality of this type of response. Supported by grants, including a Senior Principal Research Fellowship (JAH), from the National Health and Medical Research Council of Australia. We thank R Sallay for typing the manuscript.